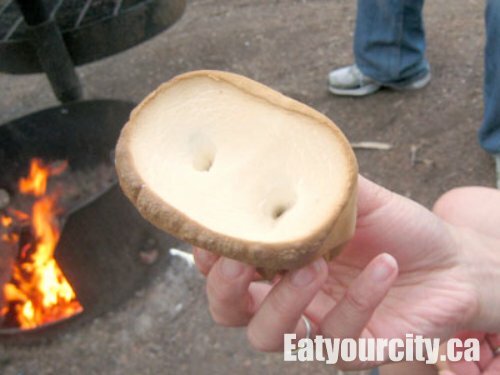 So a few highly anticipated days later, we roasted these ridiculously large marshmallows over a campfire on the Canada Day long weekend with our friends. 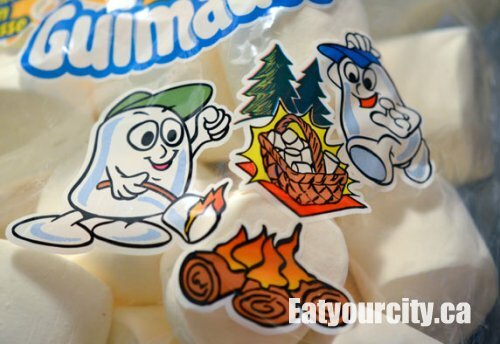 These marshmallows are a bit magical.. when you set your eyes on them, your inner child will automatically come out to play - we all remember our first time roasting a marshmallow over a smokey campfire... the marshmallow in our memory was always a huge affair... and we can relive that with these supersized marshmallows! 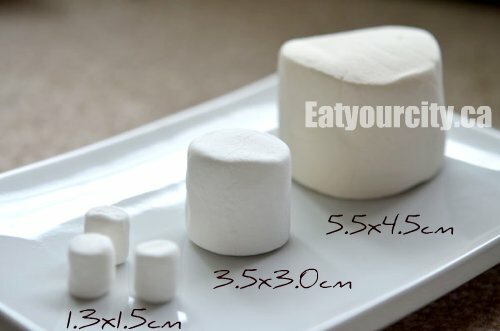 Just for fun and comparison, we brought with us to the park: mini, regular and super size marshmallows... and roasted all 3 of them together in the pic above. 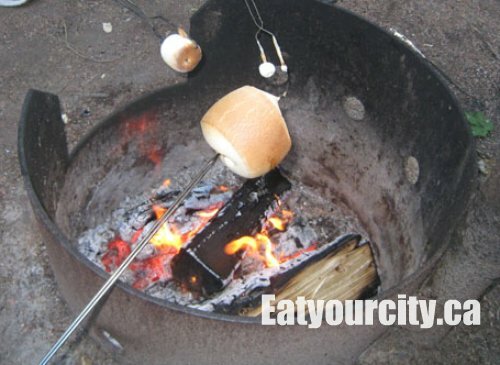 Using a single prong roasting stick/skewer did the trick, but we found using a two pronged roasting stick allowed us to roast the oversized marshmallow longer (and having it expand to 2-3x its original oversized size) without fear of it dropping into the fire. It also gave our marshmallow toasted to a mouth watering golden brown with molten marshmallow goo inside a funny pig nose look... or a close encounter with a marshmallow vampire LOL! We made some pretty awesome smores with these babies, some graham crackers and aero bars. 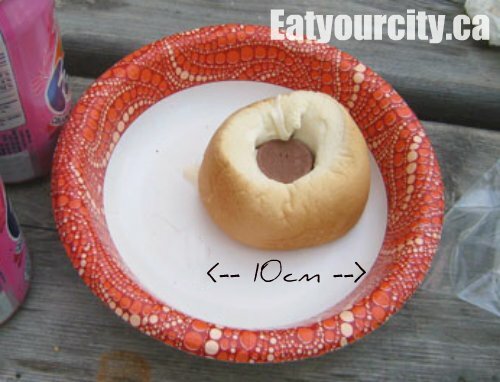 To up the indulgence level (hey, we only get to make campfire smores how many times a year?!) we swapped out the chocolate... with Caramilk wafers. Yup, they look like thin melting chocolate wafers but with silky Caramilk caramel inside. Nom! And since the super sized marshmallows were easier to just bite into rather than try to stack several graham crackers all over it... we made the ultimate inside-out smore. We stuffed the inside of the marshmallow full of Caramilk wafers... a super sized marshmallow with melted milk chocolate and smooth caramel.... NOM! I shall admit to lurking and reading ... but many a visit. This post warmed my heart as a campfire is always a place for friends, fellowship, and SUGAR! I debated running out and grabbing a bag of these supersized mallows for a family campout ... but instead decided that a non-sugar-filled nephew would be a better sleeping option. For another time ... now that I know they exist. MWAAA HA HA HA! Heehee I agree.. looove the scent of a campfire - a whiff of the distinctive scent of campfire smoke never fails to evokes many wonderful memories of friends gathered round for camping trips, food and laughter.